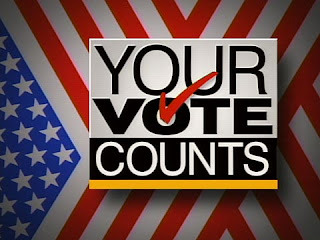 The Urban Politico: Vote Your Conscience!!!! As the election approaches it appears as if the President or his major party opponent may have a more difficult road to (re-)election than he or his partisans initially anticipated. So we see some bloggers, political leaders or media personalities scurrying forth to invoke fear and hurl insults against independent minded people who are not going to vote for either major party candidate. They congratulate themselves on their supposed wisdom in their voting choice and demand that others do likewise. They trot out their favorite policy hobby horse to convince you that you MUST vote for their candidate. If that doesn't work then they insult your intelligence or question your membership in whatever involuntary racial/gender group to which you happen to belong. Finally if all this fails to persuade you they'll trot out the spectre of the OTHER GUY getting to make appointments to the Supreme Court and talk ominously about the 2000 election. If their guy wins they will be back to mock you as a loser. And if their guy loses they will rush back to spew putrid vitriol in your general direction. Nader and Perot loom large as betes noires for them. My conscience and vote belong to me. Nobody else. Anyone who lectures me that I am somehow "wasting" my vote by not voting for their favored candidate can kindly go attempt an aeronautical anatomical impossibility with a rapidly revolving tasty pastry. One man with courage makes a majority. To thine own self be true. Whether you want to vote for either major party candidate, any small party candidate, write in a candidate, or refrain from voting altogether, it is your sacred right to express your political preference. That's right, your political preference, not anyone else's. You have the right to dissent. Your vote is not owed to anyone except yourself. Remember that regardless who you support next week. Vote or do not vote as you like. Someone who tries to convince you that your vote won't count unless you vote as THEY see fit is really nothing more than a bully. Don't let their fear determine your vote. Your issues and beliefs are just as important as anyone else's. Stand up for what you believe. Let your conscience be your guide. Let justice be done though the heavens fall.